Altar cards came into use in the sixteenth century as memory aids; before then, the prayers were all recited by heart. Because they did not yet exist in the Middle Ages, very few altar cards resemble illuminated manuscripts in either their decoration or their symbolism. When I received a commission to draw a set of altar cards, in ink on calfskin vellum with gold and palladium leaf details, I was excited to have an opportunity to give them a distinctly medieval appearance and arrangement. Illuminated manuscripts, panel paintings and millefleur tapestries of the fifteenth century strongly influenced their design. 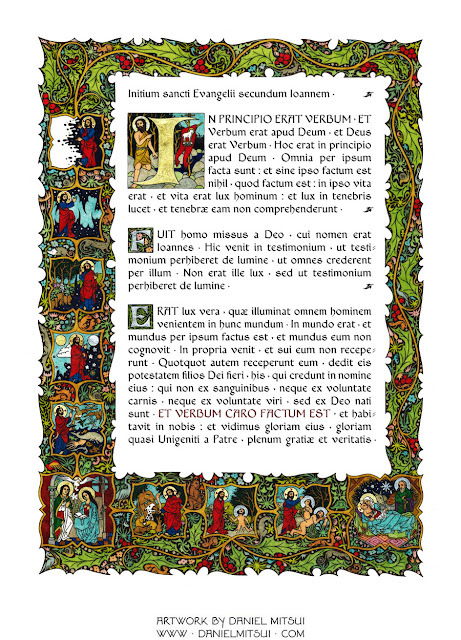 The Gospel side card contains the beginning of the Gospel of St. John (In principio erat Verbum), and the pictures on it reflect the themes of Creation and Incarnation. 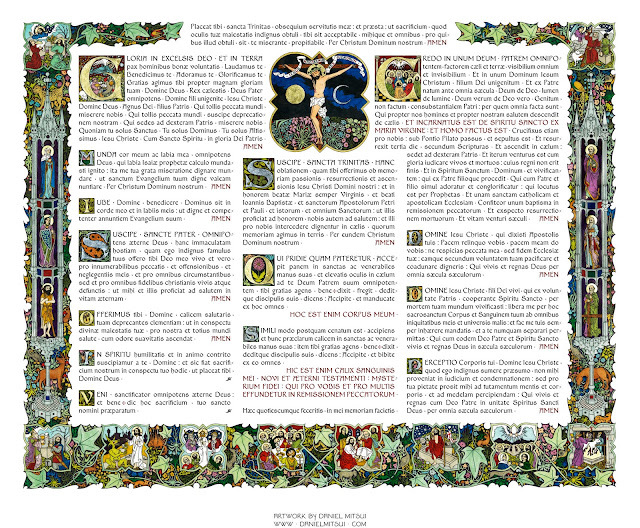 Running down the left border and across the bottom, a series of eight small scenes illustrate the six days of Creation, with the Creation of Adam and the Creation of Eve depicted individually. Following the older iconographic tradition, and the words of the Gospel itself (Omnia per ipsum facta sunt: et sine ipse factum est nihil, quod factum est), the Creator depicted in these miniatures is God the Son. The preaching of John the Baptist appears in the historiated initial. In the bottom corners I drew the Annunciation and the Nativity of Jesus Christ, which begin a sequence of events in the life of Christ that runs across the bottoms of all three cards. It continues on the Epistle side card, with the Adoration of the Magi and the Baptism of Christ. The historiated initial and the eight small scenes depict nine of the prophecies read at the ancient ceremonies of the Easter Vigil: the Deluge and Noah’s Ark, Pharaoh’s army drowned in the Red Sea, a prophecy of Isaiah, a prophecy of Baruch, Ezekiel’s vision of the valley of dry bones, another prophecy of Isaiah, the repentance of Nineveh, the Canticle of Moses and Shadrach, Mesach and Abednego in the furnace. These prophecies are associated with Baptism, and thus fitting to the psalm on the card (Lavabo inter innocentes). On the central card, in each of the four corners is the scene of an Old Testament prefigurement of the Eucharistic sacrifice: the Sacrifice of Abel, Abraham’s sacrifice of Isaac, the Sacrifice of the Paschal Lamb and the Sacrifice of Melchizedek. 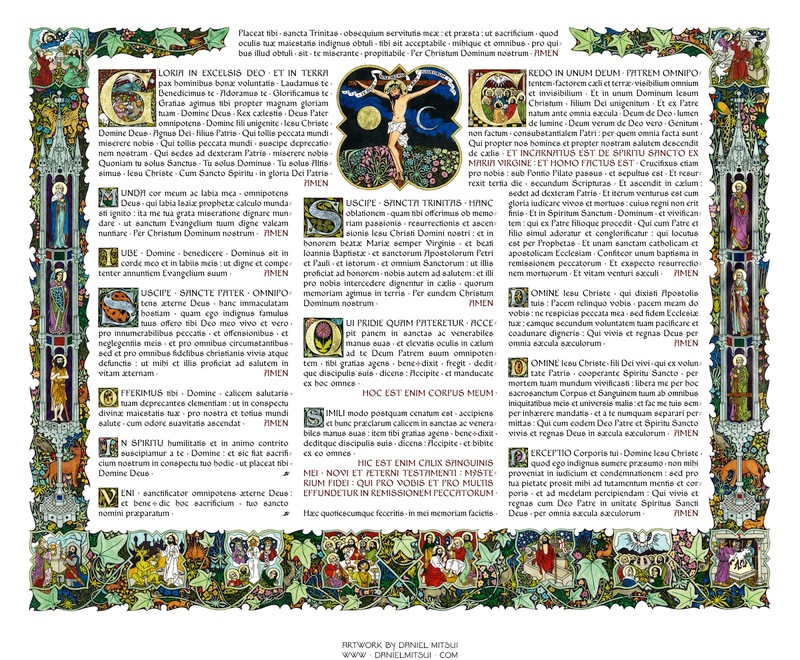 Three of these are mentioned in the Canon of the Mass; two of them, together with the Creation depicted on the Gospel cards and the nine prophecies depicted on the Epistle card, complete the twelve prophecies of the Easter Vigil. Running along the bas-de-page are six scenes from the life of Christ: the Temptation in the desert, the Transfiguration, the Last Supper, His washing St. Peter’s feet, the Resurrection and the Ascension. The historiated initials that begin the Gloria and Credo contain, respectively, pictures of the Annunciation to the Shepherds and the Descent of the Holy Ghost at Pentecost. 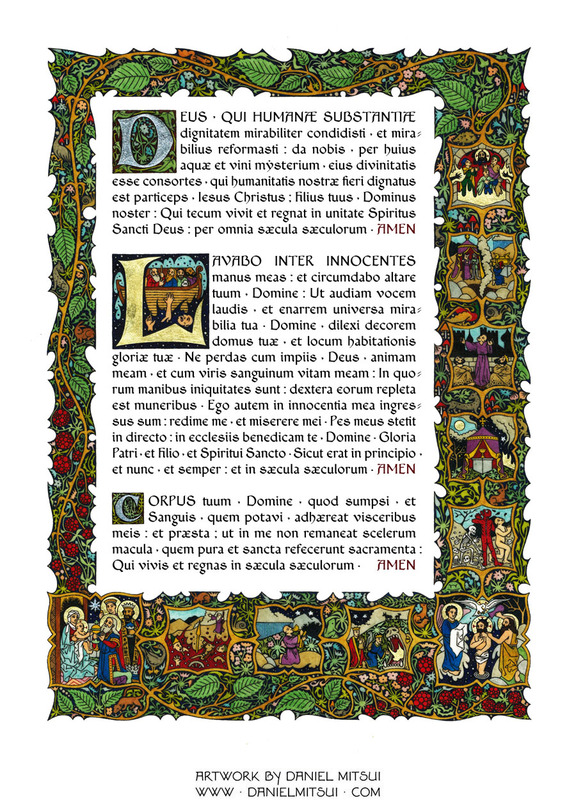 I drew a large picture of the Crucifixion at the top of the central column of text. The arrangement of scenes summarizes the liturgical year: the Gospel card represents Advent, as the Preaching of John the Baptist is the subject of the Gospel reading for the 3rd and 4th Sundays, and the Annunciation Gospel is read on the Ember Wednesday. Advent of course concludes with the Nativity, which begins the Christmas season. Continuing in chronological order to the Epistle side card, the Adoration of the Magi and the Baptism of Christ represent Epiphany; both are manifestations of Jesus Christ’s divinity. The two scenes below the left column on the central card have a longstanding iconographic association, being recounted in the Gospel readings for the first two Sundays of Lent. In the central column of the central card, the Last Supper, the washing of feet, an the large Crucifixion together represent the Holy Triduum, the center of the liturgical year. The images in the next column (Resurrection, Ascension and Pentecost) represent the Easter and Pentecost seasons. On the left and right borders of the central card I drew standing figures of six saints. On the left are the first three mentioned in the Confiteor: the Blessed Virgin Mary, Michael the Archangel and John the Baptist. On the right are three more mentioned in the Libera nos: the Apostles Peter, Paul and Andrew. The spelling and punctuation of the text follow the typical edition of the 1962 Roman Missal. Since I was asked to calligraph the cards myself, I had the challenge of finding a script that would match well with artwork in a Gothic style, yet be legible to modern eyes that are not used to blackletter. Eventually, I decided to develop my own script; this became the basis of my first typeface, Benedict. I used this typeface to arrange the text on the altar cards and create guides for the calligraphy. For the printed altar cards (shown here) I substituted the typeset text for the handwritten, as it is easier to read. You can see higher-resolution scans, or order printed altar cards, here. 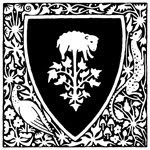 The History of Watts & Co.